It’s fair to say that hover mowers are a mixed bag, some people love them, some people hate them. Some perform pretty well, others are next to useless. 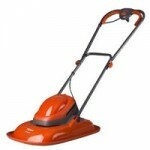 None the less it would be remiss of us not to evaluate the best and worst of the hover mower market, so that if you do choose to go down the hover mower route, you can at least make the best choice possible. Hover lawn mowers work on the same principle as a hovercraft, downward thrust created by the blade/fan blade creates a cushion of air that the mowers sits and glides on. The main advantage to you is one of manouvrability, unlike a wheeled mower you can freely push and pull the mower in any direction. One name more than any other springs to mind when people think of hover mowers, and that of course is Flymo. Flymo were the first, and are still arguably the best in the business in this particular sub section of the lawn mower market. 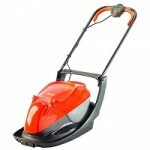 However it’s important to note that there are other manufacturers who also make hover mowers. So don’t go thinking Flymo have the monopoly by any means. 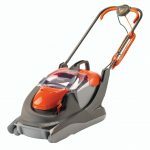 The second most important thing to consider is that there are two primary types of hover lawn mower, those that have an integrated grass collection box (like most other types of lawn mower) and those that don’t. 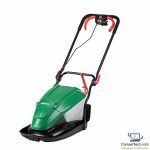 The general concensous among most people is that whilst the non collecting type of hover mower has a distinct use and purpose, the collecting type is more of an example of marketing hype than a genuinely useful tool. A non collecting hover mower is best used alongside a conventional push or ride on mower for tackling areas the conventional mower struggles with, such as slopes and banks. Alternatively if you don’t mind discharging the grass onto your lawn, a non collecting hover mower will work perfectly well in this scenario too. The reason we describe a collecting hover mower as being ‘marketing hype’ is because of one simple but very important flaw. 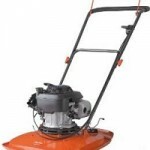 The air cushion principle is such that the amount of lifting force the craft/mower is able to generate is directly related to the power to weight ratio of the engine. If the engine is under powered or the craft is too heavy, there won’t be enough power to lift it off the ground. The trouble with a collecting hover mower is that the overall weight of the mower varies depending on how much grass is in the collection box, and because the power of the engine or motor doesn’t increase to compensate, the air cushion ‘hover height’ will reduce, perhaps to the point at which it barely gets of the ground at all. 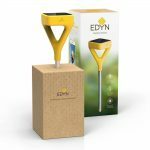 All this is very bad news for your lawn, as it will result in an eneven cut, and you might find that scalping also becomes more of a problem.